Posted by colbrarj on Thursday, January 10, 2019 in Uncategorized. 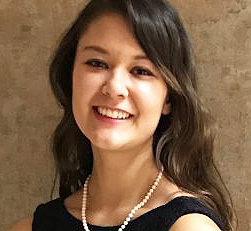 Not only did Caleigh (Nakagawa Lab) successfully defend her PhD dissertation several weeks ago, but she also has been selected as the 2019 recipient of The Anne Karpay Award in Structural Biology. Caleigh was chosen for her ability to perform outstanding research and for her collegiality and willingness to engage those around her. Great job on all fronts Caleigh!